Dawn Climb: 03:30. Day Climb: 09:00. Night Climb: 17:00. Twighlight Climb: 15:00. Wheter you choose to climb the bridge for sunset, sunrise or under the hot afternoon sun is totally up to you. Each climb offers an entirely different perspective of Sydney. We are comparing Bridge Climb Sydney Prices from leading ticket suppliers and Try to find you Cheap tickets prices on the market. A group hike over the famous Sydney Harbour Bridge at dawn, day, twilight and night. Views change completely depending on what time of day (or night!) you hike and group sizes can be as big as 13. It's an unforgettable bucket list experience packed with adrenaline. The bridge climb is an integral part of the city and many travel far and wide to tick it off their bucket list. Over 3 million people worldwide have climbed it. The bridge is an iconic landmark and you can drive, walk, cycle or catch the train across it. The bridge opened in 1932 and is considered an engineering masterpiece. It's one of the most photographed attractions in the city. You'll be 134 meters above the water as you climb along the outer arch of the bridge, along catwalks and ladders. After the climb you'll receive a Climber Certificate and a Climber cap to commemorate your achievement. Climbs operate in almost all weather conditions (unless extreme) and you will be equipped with all the gear you need to keep you dry. During the climb you'll be given headphones so you can hear your guide during the tour, they'll be encouraging you while giving a history lesson on the bridge! Great family activity (children over 8). Your Experience With Bridge Climb Sydney? Head to the meeting point and be greeted by the Bridge Climbs friendly staff. After a safety briefing you'll be kitted out for the climb with jumpsuit, helmet and harness. Head out to the foot of the bridge to begin the climb. Over the next 1.5 hours you'll ascend the bridge climbing up catwalks and ladders. Reach the summit of the Sydney Harbour Bridge and feel a sense of pride. Take in the breathtaking panoramic views over Sydney Harbour and the Opera House. Pose for a picture as your guide flashes the camera. Once you've enjoyed the views and caught your breath, the tour will descend back down to the starting point. 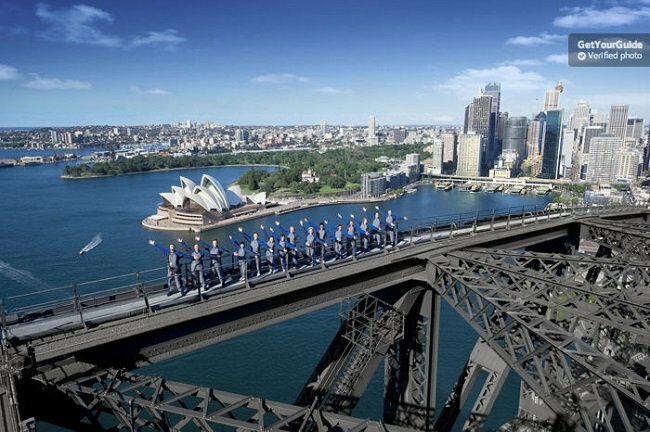 What Bridge Climb Sydney Includes? Knowledgable guide during the climb. A climbers certificate and cap. Don't drink heavily the night before the climb, you'll be breathalised before the hike begins to make sure your alcohol-blood reading is below 0.05! Travelers Reviews about Bridge Climb Sydney? The Sydney Bridge Climb has earned over 4,716 reviews and a 4.5-star rating on TripAdvisor. Travellers agree that this activity offered a wonderful experience and was a must do for visitors in the city. Most users claimed the Night hike was the most breathtaking with the Twighlight hike coming in second most popular. This tour is not accessible for wheelchair users. Printed or mobile voucher accepted (tickets booked through Viator must be printed). Tickets booked through Get Your Guide can be cancelled for a full refund 15 days in advance. Tickets booked through Viator can be cancelled for a full refund 7 days in advance. Tour times change depending on the season. Make sure you check with your tour guide the time of your departure. Climbers cannot take cameras up for safety reasons. You must be 8 years old to participate. Meeting point: 3 Cumberland Street, The Rocks, NSW 2000, Sydney.